The unmistakable slowdown in China’s economy once again prompted some fairly heavy selling in the commodities’ space overnight and this morning on the heels of the largest cut in bullish positions by speculators since the summer of 2008. Assorted hedge funds reduced such positions by 1.1% while at the same time commodity prices fell by 1.5%. Copper and oil contract position reductions were notable. The catalyst for this morning’s downside price action came from the tallying of China’s largest trade gap (more than $34 billion) in more than two decades on Saturday. When combined with the data concerning that country’s factory output and consumer retail activity, the conclusion that China is indeed experiencing notable difficulties is obviously not very hard to draw. Commodity market watchers have cautioned quite some time ago that "as goes China so do commodities." As of today, that direction is lower. Another important economy — that of India — also reported a ballooning of its trade gap (imports up 21%, exports up only 4.3%) for the month of February. India’s economy expanded at the rate of 6.1% in Q4 of last year; the slowest growth rate since 2008. Also, do recall that there were recent reports concerning the fact that gold imports into India were one of the most noteworthy contributors to that country’s current account deficit. China is estimated to consume roughly 40% of global copper supplies, 43% of world aluminum output, and 46% of the available amounts of nickel. With Europe limping along and showing signs of contraction in certain regions, it is also worth noting that it accounts for 18% of global copper demand and 22% of world oil consumption. In the wake of apprehensions related to the situation in the above regions, the speculative pros slashed their net-long positions in gold futures and options by 26% in the latest reporting period, according to the CFTC’s data. The morning analysis from Standard Bank (SA) suggests that the growing gaps in such bets are "not surprising, given the overly enthusiastic stance of the futures market during the previous weeks." As for silver, the decline seen in similar positions more than obviated the gains that had been achieved in the previous two months. The relative exceptions to the trend were noted in the platinum and palladium positioning where although ETF buying did decline, the speculative longs remain basically on hold. Monday’s New York spot dealings opened with gold sliding under the pivotal $1,700 mark once again and giving up all of and more than Friday’s hard-fought gains. Mind you, absent the possibility that the specs bought up some metal in the wake of the news that a ratings agency had basically declared Greece in a technical default, it was hard to find a good motivation for the gains seen on the last trading day of last week. The non-farm payrolls report and dollar strength had initially led the metals to significantly lower value levels as perceptions that the Fed might not have to ease any further gained traction. Spot gold was quoted at $1,696 per ounce showing a loss of $17.50 while silver’s bid was indicated at $33.60 per ounce, down 72 cents on the day. Scotia Mocatta’s technical analysis opines that if gold were to breach $1,690 such an event could prompt additional fresh liquidation of long positions. UBS analysts were quoted to say that "Although gold has managed to claw its way back above $1,700, our technical strategist highlights that the overall picture remains challenging. The Moving Average Convergence Divergence is below zero, which is bearish, and with momentum falling, "stalwart" resistance is expected at $1,712.80 an ounce, the 38% Fibonacci retracement of the February-March selloff. Emotions are likely running high in the gold community at the moment — a mixture of disappointment, confusion and uncertainty about what is to come." For the moment, that "what" is largely perceived as the Fed meeting. "silver’s current and confirmed Rising Wedge [shows] a target of about $26 per ounce and a pattern that could begin to take silver down any day now or may hold off for another week to few weeks in sideways trading between about $32 and $36 per ounce before that decline is made." "gold is trading in a similar set-up that preceded its correction back in 2008 and that is a Descending Trend Channel and Symmetrical Triangle combo with the Channel calling for a drop down toward its bottom trend line around $1,475 per ounce and the Symmetrical Triangle suggesting the decline could be much deeper toward its minimum target of $1,125 per ounce and a region that offers good long-term support to gold." Stepping away from technical charts for a moment, we note that the McClellan Report found that ETF investors did not appear to react to gold’s most recent drop in the fashion that they were expected to. This gap between price action and "capitulation" worries Tom McClellan, the author of the eponymous market report. He tenders that "When we see a very fast drop in ETF assets, that is the sign of public fear about gold prices that marks a good bottom for gold prices. But when you see these assets rise as gold prices are falling, those instances are typically followed by a further decline in gold prices, to more completely scare people away so that the next uptrend can begin. "If investors decide to flee gold as an investment, then gold the asset class will be crushed. We think [the aftermath] could be monumentally bad. 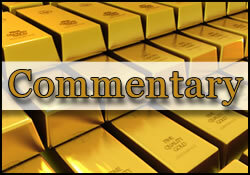 "Consider that gold is both a single security and almost an entire asset class on its own. When the tech bubble happened, you could have moved to financials and kept your equity weight in line, or even within tech, you could have underweighted web companies and over-weighted hardware, semiconductors or software. There were numerous ways in which an investor – with good hindsight of course – could have fled the troubled securities, yet still had similar equity exposure. In a way, this prevented the web bubble from being even worse. Meanwhile, on the fundamentals’ front, we have news that at least one central bank appears ‘sated’ with gold intake. Taiwan central bank Governor informs that while his institution made some nice money on the purchases it made in 2008, it does not plan to acquire more of this "risky asset." The Governor also said that Taiwan does not plan to reduce its $177.3 billion in US Treasury holdings and that one of his main concerns — despite not adding to the country’s gold holdings — remains inflation. A fairly hefty drop was also noted in black gold; it fell $1.45 to just under $106 per barrel in the wake of news that US production is quite robust whereas supply anxieties related to the Middle East experienced an easing. Global growth concerns (China) continue to weigh on the minds of speculators in oil as well. Rhodium remained flat at $1,475 on the bid-side. Copper declined nearly 1% and the US dollar orbited in and around the pivotal 80 marker on the trade-weighted index; the highest level since late January. "platinum and palladium will continue to struggle in Q1:12 on the back of a lack of real demand. For this reason, we feel that a price above $1,650, for platinum, and $700, for palladium, will be difficult to sustain. However, on the downside, platinum and palladium at $1,500 and $600 respectively, is too low, based on cost pressures in the industry." Until Wednesday, the day after the Fed, we go back to scanning the greenback… and minding the gaps.